Kough & Leeper cabinet card portrait. Private Collection. This very handsome gentleman from the 1880s is very smartly dressed. The striped tie is rather nice too. No need to edit the contrast or erase scratches on this one. Like the timeless elegance of the sitter, this picture stood the test of time. The scalloped edges are golden too, truly a beautiful card which was kept in an album. Photographer: Kough & Leeper. 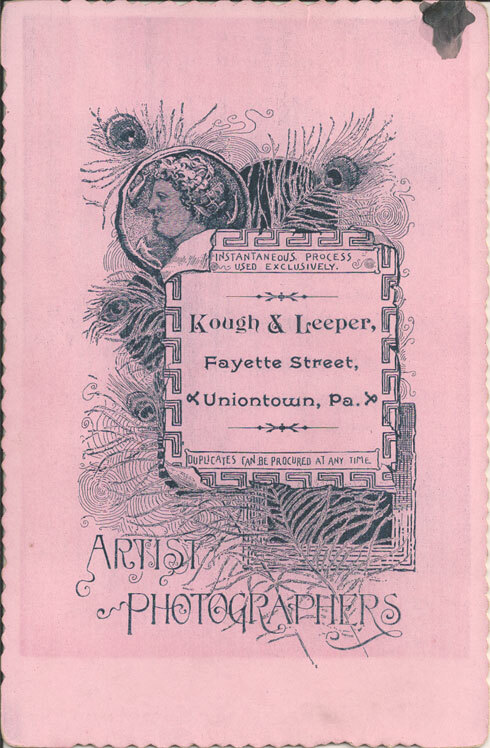 Fayette St. Uniontown, Pennsylvania. This entry was posted on Sunday, July 12th, 2015 at 4:39 pm	and tagged with 1890s, fashion, handsome man, menswear, Pennsylvania, portrait, Uniontown, victorian and posted in Cabinet Cards, Gentlemen. You can follow any responses to this entry through the RSS 2.0 feed. Very crisp right down to the very neat hair cut. I do like the backs of the cabinet cards as they are often very ornate. Yes, he looks like he could be seen today at a fancy wedding. If there’s a back I’ll post it, weirdly though, most of my cabinet cards so far are blank on the back. Pity because they’re really neat…especially the ones from the 1890s when the logos got really intricate. He certainly was beautiful. There was coal and coke money in Uniontown, which is south of Pittsburgh.